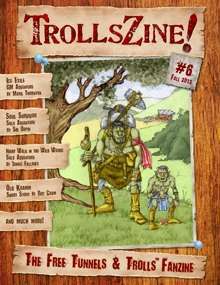 The sixth issue of the fan-created magazine for Tunnels and Trolls™, edited by Dan Hembree, contains 58 pages of quality content brought to you by the fans of the game for absolutely free. This issue features two solo adventures, “Night Walk in the Wild Woods” by James Fallows and “Soul Survivor” by Sid Orpin; a GM adventure, “Ice Exile” by Mark Thornton; and a short story, “Old Kramm” by Roy Cram. TrollsZine! #6 also includes articles on obtaining food for adventurers; acquiring henchmen for solo delvers; alternate armor rules; an NPC elven wizard description; a short, one-room GM scenario; and more. Contributors to TrollsZine! #6 include Roy Cram, E. P. Donahue, James Fallows, Dan Hembree, Paul Ingrassia, David Moskowitz, Stefan Jones, Sid Orpin, Mark Thornton, and Justin Williams. TrollsZine! #6 is amazingly well-illustrated by Darrenn E. Canton, Alexander Cook, Patrick Crusiau, E. P. Donahue, James Fallows, Jeff Freels, J. Lambert, Simon Lee Tranter, David Ullery, and M. E. Volmar, with cover art by Patrick Crusiau. TrollsZine! is a Trollbridge production brought to you with the kind support of Flying Buffalo Inc., Ken St. Andre, and Rick Loomis.